pine geometric shelf. armor cuff ring. mint mason jar lid. southwest print iPad mini sleeve. suede and shell necklace. cedar geometric forrest painting. tribal phone case. organic mint turkish cotton bath towel. americana wall hanging. 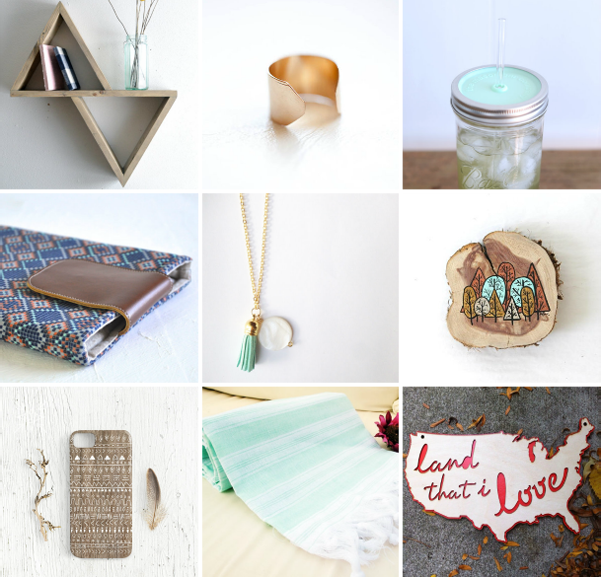 There's just no surprise that right now I am loving all things mint colored and made out of wood. Or resembling wood. Or wanting to be found in a wooden forrest. So soothing and lovely. I hope you'll check out these amazing artists! I love that necklace! So pretty and unique! So I went to comment on this post when I saw the "You might also like:... Butterfinger Fudge" and I got super excited because I've been looking for something sweet to make Daniel for his birthday and butterfinger is his favorite. But, looks like I'll have to keep looking because I don't think I'll be able to find cheap candy corn, haha! Maybe for Halloween next year I'll make it for him! I smiled when I saw this because I just finished working on a little something like this. That Land that I love sign is the best! Hello! I stumbled across your blog from my Etsy shop :) Thanks so much for featuring my painting along with these other totally awesome Etsy finds! Will be following your blog from now on, I can always use new and delicious recipes! Oh you are so welcome! I was actually just about to send out this morning's emails to all of you lovely artists to let you know I had featured you! So glad you found me! You do great work! oh my goodness! i love ALL of these things!! that ring, though, and the "land that i love". swoon.